Joy, my sistah, hope; experience the essence of humanity. That is what you bring to the world. It is more sacred than you think. You may never in this life understand the impact you have upon the world. 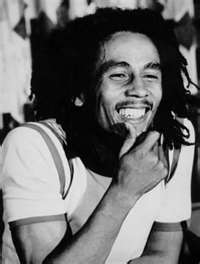 This entry was posted in Bob Marley Fridays and tagged Bob Marley, celebrity ghosts. Bookmark the permalink. Seriously, though, excellent message to pass on. Marley didn’t communicate those two, only the gasp of surprise. Not that I blame them one bit.